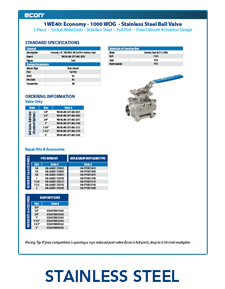 The Econ® E40 Series is an economy three piece, full port ball valve with NPT ends. The E40 is rated to 1000 WOG and is available in sizes ranging from ¼” to 2”. Valve bodies are made of CF8M with 316SS trim and PTFE seats. This valve is also available in Socket Weld.